The earliest attestations of a Semitic language are in Akkadian, dating to around the 23rd century BC (see Sargon of Akkad) and the Eblaite language, but earlier evidence of Akkadian comes from personal names in Sumerian texts around 28th century BC. Researchers in Egypt also claim to have discovered Canaanite snake spells: "The passages date from between 2400 to 3000 BC and appear to be written in Proto-Canaanite, a direct ancestor of Biblical Hebrew." Since all modern Semitic languages can be traced back to a common ancestor, Semiticists have placed importance upon locating the urheimat of the Proto-Semitic language. The Urheimat of the Proto-Semitic language may be considered within the context of the larger Afro-Asiatic family to which it belongs. The previously popular hypothesis of an Arabian urheimat has been largely abandoned, since the region could not have supported massive waves of emigration before the domestication of camels in the second millennium BC. There is also evidence that Mesopotamia (and adjoining areas of modern Syria) were originally inhabited by a non-Semitic population. Map of Semitic languages and statistically inferred dispersals. One hypothesized location of the divergence of ancestral Semitic from Afroasiatic between the African coast of the Red Sea and the Near East is also indicated. 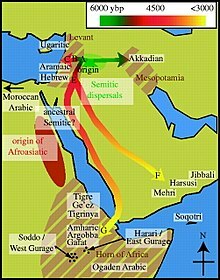 A Bayesian analysis performed in 2009 suggests an origin for all known Semitic languages in the Levant around 3750 BCE, with a later single introduction from South Arabia into the Horn of Africa around 800 BCE. This statistical analysis could not, however, estimate when or where the ancestor of all Semitic languages diverged from Afroasiatic. It thus neither contradicts nor confirms the hypothesis that the divergence of ancestral Semitic from Afroasiatic occurred in Africa. Christopher Ehret has hypothesized that genetic analyses (specifically those of Y chromosome phylogeography and TaqI 49a,f haplotypes) shows populations of proto-Semitic speakers may have moved from the Horn of Africa or southeastern Sahara northwards to the Nile Valley, northwest Africa, the Levant, and Aegean. Some geneticists and archaeologists have argued for a back-migration of proto-Afroasiatic speakers from Western Asia to Africa as early as the 10th millennium BC. They suggest the Natufian culture might have spoken a proto-Afroasiatic language just prior to its disintegration into sub-languages. The hypothesis is supported by the Afroasiatic terms for early livestock and crops in both Anatolia and Iran. did not likely originate in Arabia, as previously hypothesized, since the region could not have supported massive waves of emigration before the domestication of camels in the second millennium BC. shares more isoglosses and lexicostatistical convergences with the Berber languages than any other family, thereby showing signs of a link with Berber long after other Afro-Asiatic language families, such as Egyptic and Chadic, and was still spoken during the mid-Neolithic Subpluvial (i.e. 5th millennium BCE, when the Sahara was more humid). A Neolithic culture in the Sahara possibly related to Proto-Semitic collapsed due to desertification and climate change around 3500 BC, according to Lipiński – a fact attested by evidence such as rock art. This may have forced Proto-Semitic speakers to emigrate en masse through the Nile Delta to Western Asia. They were probably responsible for the collapse of the Ghassulian culture in Palestine around 3300 BC. Another indication of the arrival of the proto-Semitic culture is the appearance of tumuli in 4th and 3rd millennium BC Palestine, which were typical characteristic of Neolithic Maghreb, especially in Algeria. It is possible that at this point, the ancestors of the speakers of Elamite moved towards Iran, although the inclusion of Elamite in Afroasiatic is only contemplated by a tiny minority. The earliest wave of Semitic speakers entered the Fertile Crescent via Palestine and Syria and eventually founded the Akkadian Empire. Their relatives, the Amorites, followed them and settled Syria before 2500 BC. The collapse of the Bronze Age in Palestine led the southern Semites southwards, where they reached the highlands of Yemen after 20th century BC. Those crossed back to the Horn of Africa between 1500–500 BC. The fricatives *s *z *ṣ *ś *ṣ́ *ṱ may also be interpreted as affricates (/t͡s d͡z t͡sʼ t͡ɬ t͡ɬʼ t͡θʼ/), as is discussed below. The probable phonetic realization of most consonants is straightforward and is indicated in the table with the IPA. Two subsets of consonants, however, deserve further comment. In modern Semitic languages, emphatics are variously realized as pharyngealized (Arabic, Aramaic, Tiberian Hebrew (such as [tˤ]), glottalized (Ethiopian Semitic languages, Modern South Arabian languages such as [tʼ]), or as unaspirated (Turoyo of Tur-Abdin such as [t˭]); Ashkenazi Hebrew and Maltese are exceptions and emphatics merge into plain consonants in various ways under the influence of Indo-European languages (Italian/Sicilian for Maltese, German/Yiddish for Hebrew). An emphatic labial *ṗ occurs in some Semitic languages, but it is unclear whether it was a phoneme in Proto-Semitic. Hebrew developed an emphatic labial phoneme ṗ to represent unaspirated /p/ in Iranian and Greek. Ge'ez is unique among Semitic languages for contrasting all three of /p/, /f/, and /pʼ/. While /p/ and /pʼ/ occur mostly in loanwords (especially from Greek), there are many other occurrences whose origin is less clear (such as hepʼä 'strike', häppälä 'wash clothes'). The precise sound of the Proto-Semitic fricatives, notably of *š, *ś, *s and *ṣ, remains a perplexing problem, and there are various systems of notation to describe them. The notation given here is traditional and is based on their pronunciation in Hebrew, which has traditionally been extrapolated to Proto-Semitic. The notation *s₁, *s₂, *s₃ is found primarily in the literature on Old South Arabian, but more recently, it has been used by some authors to discus Proto-Semitic to express a noncommittal view of the pronunciation of the sounds. However, the older transcription remains predominant in most literature, often even among scholars who either disagree with the traditional interpretation or remain noncommittal. The primary disagreements concern whether the sounds were actually fricatives in Proto-Semitic or whether some were affricates and whether the sound designated *š was pronounced [ʃ] (or similar) in Proto-Semitic, as the traditional view posits, or had the value of [s]. The issue of the nature of the "emphatic" consonants, discussed above, is partly related (but partly orthogonal) to the issues here as well. In how many sounds are taken to be affricates. The "minimal affricate" position takes only the emphatic *ṣ as an affricate [t͡sʼ]. The "maximal affricate" position additionally posits that *s *z were actually affricates [t͡s d͡z] while *š was actually a simple fricative [s]. In whether to extend the affricate interpretation to the interdentals and laterals. The "minimal extension" position assumes that only the sibilants were affricates, and the other "fricatives" were in fact all fricatives, but the maximal update extends the same interpretation to the other sounds. Typically, that means that the "minimal affricate, maximal extension" position takes all and only the emphatics are taken as affricates: emphatic *ṣ θ̣ ṣ́ were [t͡sʼ t͡θʼ t͡ɬʼ]. The "maximal affricate, maximal extension" position assumes not only the "maximal affricate" position for sibilants but also that non-emphatic *θ ð ś were actually affricates. Affricates in Proto-Semitic were proposed early on but met little acceptance until the work of Alice Faber (1981) who challenged the older approach. The Semitic languages that have survived often have fricatives for these consonants. However, Ethiopic languages and Modern Hebrew, in many reading traditions, have an affricate for *ṣ. The evidence for the various affricate interpretations of the sibilants is direct evidence from transcriptions and structural evidence. However, the evidence for the "maximal extension" positions that extend affricate interpretations to non-sibilant "fricatives" is largely structural because of both the relative rarity of the interdentals and lateral obstruents among the attested Semitic language and the even-greater rarity of such sounds among the various languages in which Semitic words were transcribed. As a result, even when the sounds were transcribed, the resulting transcriptions may be difficult to interpret clearly. Transcriptions of Ge'ez from the period of the Axumite Kingdom (early centuries AD): ṣəyāmo rendered as Greek τζιαμω tziamō. The Hebrew reading tradition of ṣ as [t͡s] clearly goes back at least to medieval times, as shown by the use of Hebrew צ (ṣ) to represent affricates in early New Persian, Old Osmanli Turkic, Middle High German etc. Similarly, Old French c /t͡s/ was used to transliterate צ: Hebrew ṣɛdɛḳ "righteousness" and ʼārɛṣ "land (of Israel)" were written cedek, arec. There is also evidence of an affricate in Ancient Hebrew and Phoenician ṣ. Punic ṣ was often transcribed as ts or t in Latin and Greek or occasionally Greek ks; correspondingly, Egyptian names and loanwords in Hebrew and Phoenician use ṣ to represent the Egyptian palatal affricate ḏ (conventionally described as voiced [d͡ʒ] but possibly instead an unvoiced ejective [t͡ʃʼ]). Aramaic and Syriac had an affricated realization of *ṣ until some point, as is seen in Classical Armenian loanwords: Aramaic צרר‎ 'bundle, bunch' → Classical Armenian crar /t͡sɹaɹ/. The "maximal affricate" view, applied only to sibilants, also has transcriptional evidence. According to Kogan, the affricate interpretation of Akkadian s z ṣ is generally accepted. Akkadian cuneiform, as adapted for writing various other languages, used the z- signs to represent affricates. Examples include /ts/ in Hittite, Egyptian affricate ṯ in the Amarna letters and the Old Iranian affricates /t͡ʃ d͡ʒ/ in Elamite. Egyptian transcriptions of early Canaanite words with *z, *s, *ṣ use affricates (ṯ for *s, ḏ *z, *ṣ). West Semitic loanwords in the "older stratum" of Armenian reflect *s *z as affricates /t͡sʰ/, /d͡z/. Greek borrowing of Phoenician 𐤔 *š to represent /s/ (compare Greek Σ), and 𐤎 *s to represent /ks/ (compare Greek Ξ) is difficult to explain if *s then had the value [s] in Phoenician, but it is quite easy to explain if it actually had the value [t͡s] (even more so if *š had the value [s]). There is also a good deal of internal evidence in early Akkadian for affricate realizations of s z ṣ. Examples are that underlying ||*t, *d, *ṭ + *š|| were realized as ss, which is more natural if the law was phonetically ||*t, *d, *ṭ + *s|| → [tt͡s], and that *s *z *ṣ shift to *š before *t, which is more naturally interpreted as deaffrication. Evidence for *š as /s/ also exists but is somewhat less clear. It has been suggested that it is cross-linguistically rare for languages with a single sibilant fricative to have [ʃ] as the sound and that [s] is more likely. Similarly, the use of Phoenician 𐤔 *š, as the source of Greek Σ s, seems easiest to explain if the phoneme had the sound of [s] at the time. The occurrence of [ʃ] for *š in a number of separate modern Semitic languages (such as Neo-Aramaic, Modern South Arabian, most Biblical Hebrew reading traditions) and Old Babylonian Akkadian is then suggested to result from a push-type chain shift, and the change from [t͡s] to [s] "pushes" [s] out of the way to [ʃ] in the languages in question, and a merger of the two to [s] occurs in various other languages such as Arabic and Ethiopian Semitic. Diem (1974) suggested that the Canaanite sound change of *θ → *š would be more natural if *š was [s] than if it was [ʃ]. However, Kogan argues that, because *s was [ts] at the time, the change from *θ to *š is the most likely merger, regardless of the exact pronunciation of *š while the shift was underway. Evidence for the affricate nature of the non-sibilants is based mostly on internal considerations. Ejective fricatives are quite rare cross-linguistically, and when a language has such sounds, it nearly always has [sʼ] so if *ṣ was actually affricate [tsʼ], it would be extremely unusual if *θ̣ ṣ́ was fricative [θʼ ɬʼ] rather than affricate [t͡θʼ t͡ɬʼ]. According to Rodinson (1981) and Weninger (1998), the Greek placename Mátlia, with tl used to render Ge'ez ḍ (Proto-Semitic *ṣ́), is "clear proof" that this sound was affricated in Ge'ez and quite possibly in Proto-Semitic as well. The evidence for the most maximal interpretation, with all the interdentals and lateral obstruents being affricates, appears to be mostly structural: the system would be more symmetric if reconstructed that way. The shift of *š to h occurred in most Semitic languages (other than Akkadian, Minaian, Qatabanian) in grammatical and pronominal morphemes, and it is unclear whether reduction of *š began in a daughter proto-language or in Proto-Semitic itself. Some thus suggest that weakened *š̠ may have been a separate phoneme in Proto-Semitic. See Semitic languages#Phonology for a fuller discussion of the outcomes of the Proto-Semitic sounds in the various daughter languages. ^ a b Kitchen, A.; Ehret, C.; Assefa, S.; Mulligan, C. J. (29 April 2009). "Bayesian phylogenetic analysis of Semitic languages identifies an Early Bronze Age origin of Semitic in the Near East". Proceedings of the Royal Society B: Biological Sciences. 276 (1668): 2703. doi:10.1098/rspb.2009.0408. PMC 2839953. ^ Milstein, Mati (5 February 2007). "Ancient Semitic Snake Spells Deciphered in Egyptian Pyramid". news.nationalgeographic.com. Retrieved 10 April 2017. ^ Ehret, C.; Keita, S.O.Y. ; Newman, Paul (3 December 2004). "The Origins of Afroasiatic" (PDF). Science. 306: 1680. ^ Dziebel, German (2007). The Genius of Kinship: The Phenomenon of Human Kinship and the Global Diversity of Kinship Terminologies. Cambria Press. p. 366. ISBN 978-1-934043-65-3. Retrieved 13 August 2013. ^ Nöth, Winfried (1 January 1994). Origins of Semiosis: Sign Evolution in Nature and Culture. Walter de Gruyter. p. 293. ISBN 978-3-11-087750-2. Retrieved 13 August 2013. ^ Quantitative Approaches to Linguistic Diversity: Commemorating the Centenary of the Birth of Morris Swadesh. p. 73. ^ Sáenz Badillos, Angel (1993) . "Hebrew in the context of the Semitic Languages". Historia de la Lengua Hebrea [A History of the Hebrew Language]. Translated by John Elwolde. Cambridge, UK: Cambridge University Press. pp. 18–19. ISBN 0-521-55634-1. ^ Kogan, Leonid (2012). "Proto-Semitic Phonology and Phonetics". In Weninger, Stefan (ed.). The Semitic Languages: An International Handbook. Walter de Gruyter. pp. 54–151. ISBN 978-3-11-025158-6. ^ Bomhard, A. R., & Hopper, P. J. (1984). Toward proto-nostratic : A new approach to the comparison of proto-indo-european and proto afroasiatic. Retrieved from http://ebookcentral.proquest.com (p. 136): "Cantineau (1952:91-94), Martinet (1975:238, Steiner (1977:155)"
^ Dolgopolsky 1999, p. 29. ^ Hetzron 1997, p. 147. ^ Woodard 2008, p. 219. ^ For an example of an author using the traditional symbols but subscribing to the new sound values, see Hackett, Joe Ann. 2008. Phoenician and Punic. The Ancient Languages of Syria-Palestine and Arabia (ed. Roger D. Woodard). Likewise, Huehnengard, John and Christopher Woods. 2008. Akkadian and Eblaite. The Ancient Languages of Mesopotamia, Egypt, and Aksum (ed. Roger D. Woodard). p. 96: "Similarly, there was a triad of affricates, voiced /ᵈz/ (⟨z⟩) voiceless /ᵗs/ (⟨s⟩), and emphatic /ᵗsʼ/ (⟨*ṣ⟩). These became fricatives in later dialects; the voiceless member of this later, fricative set was pronounced [s] in Babylonian, but [š] in Assyrian, while the reflex of Proto-Semitic *š, which was probably simple [s] originally, continued to be pronounced as such in Assyrian, but as [š] in Babylonian." Similarly, an author remaining undecided regarding the sound values of the sibilants will also use the conventional symbols, for example, Greenberg, Joseph, The Patterning of Root Morphemes in Semitic. 1990. p. 379. On language: selected writings of Joseph H. Greenberg. Ed. Keith M. Denning and Suzanne Kemme: "There is great uncertainty regarding the phonetic values of s, ś, and š in Proto-Semitic. I simply use them here as conventional transcriptions of the three sibilants corresponding to the sounds indicated by samekh, śin, and šin respectively in Hebrew orthography." ^ Lipiński, Edward. 2000. Semitic languages: outline of a comparative grammar. e.g. the tables on p.113, p.131; also p.133: "Common Semitic or Proto-Semitic has a voiceless fricative prepalatal or palato-alevolar š, i.e. [ʃ] ...", p.129 ff. ^ Macdonald, M.C.A. 2008. Ancient North Arabian. In: The Ancient Languages of Syria-Palestine and Arabia (ed. Roger D. Woodard). p. 190. ^ Blau, Joshua (2010). Phonology and Morphology of Biblical Hebrew. Winona Lake, Indiana: Eisenbrauns. p. 25–40. ^ Ferguson, Charles (1959), "The Arabic Koine", Language, 35 (4): 630, doi:10.2307/410601 . ^ a b Dolgopolsky 1999, p. 33. ^ a b c Kogan, Leonid (2011). "Proto-Semitic Phonetics and Phonology". In Semitic languages: an international handbook, Stefan Weninger, ed. Berlin: Walter de Gruyter. P. 62. ^ According to Kogan "Proto-Semitic Phonetics and Phonology" (2011), Steiner 1982a is the "classic exposition" (p. 62). ^ Kogan, (2011), p. 63. ^ a b c Dolgopolsky 1999, p. 32. ^ a b c Kogan (2011), p. 66. ^ Kogan (2011), p. 67. ^ Kogan (2011), pp. 67-68. ^ Kogan (2011), p. 69. ^ Quoted in Kogan (2011), p. 68. ^ Kogan (2011), p. 68. ^ Kogan (2011), p. 70, quoting Martinet 1953 p. 73 and Murtonen 1966 p. 138. ^ a b Kogan (2011), p. 70. ^ Kogan (2011), pp. 92-93. ^ Kogan (2011), p. 80. American Heritage Dictionary of the English Language (Fourth ed.). Boston & New York: Houghton Mifflin Company. 2000. ISBN 0-395-82517-2. Lipiński, Edward (2001). Semitic Languages: Outline of a Comparative Grammar. Peeters Publishers. ISBN 978-90-429-0815-4. Retrieved 30 June 2013. Hetzron; Robert (1997). The Semitic languages. Cambridge University Press. p. 572. ISBN 0-415-05767-1. Woodard, Roger (2008). The Ancient Languages of Mesopotamia, Egypt and Aksum. Cambridge University Press. p. 250. ISBN 0-521-68497-8.